Bus routes 7, 170, 171 and 172 from the Eindhoven central railway station will take you directly to the Theo Koomenlaan bus stop at the Aalsterweg. This bus stop is located next to the Indoor-Sportcentrum Eindhoven. 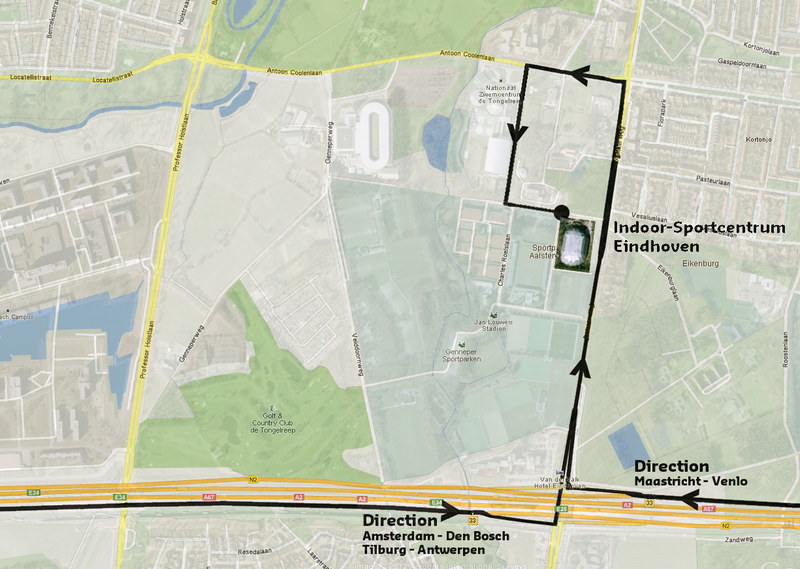 Bus number 17 will take you to a bus stop around a 5-minute walk from the Indoor-Sportcentrum Eindhoven. Make sure to get off the bus at the 'Florapark' bus stop. Take exit 33 from the N2 motorway towards Waalre/Valkenswaard. Then follow the signs to 'Waalre/Genneper Parken' at 'Best' or 'Leenderheide': instead of following the A2! Follow the road for approximately 500 metres and turn left at the first traffic light (onto Antoon Coolenlaan). Take the first left (onto Willem Elsschotlaan) and drive past the Nationaal Zwemcentrum de Tongelreep. At the end of the street, turn left and you have arrived at the car park for the Indoor-Sportcentrum Eindhoven. Cyclists can park their bikes at the bike park at the Indoor-Sportcentrum Eindhoven.